What possesses a person to drive a car or truck very little? Is it the fear of wrecking the car? Or the fear of the car depreciating in value? Was there some sort of event that influenced the vehicle’s low mileage. 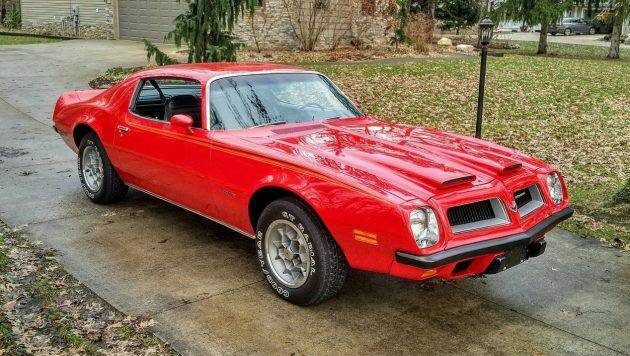 Though those questions cannot be answered with this 1974 Pontiac Firebird Formula, what is known is that this car has only travelled 8,237 miles in its lifetime. 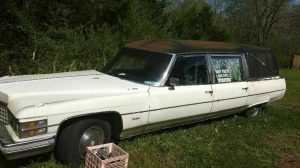 We featured this same car back in February, but it’s now listed here on craigslist in Indianapolis, Indiana, with an asking price of $24,000 obo. Special thanks to Pat L. for the submission! 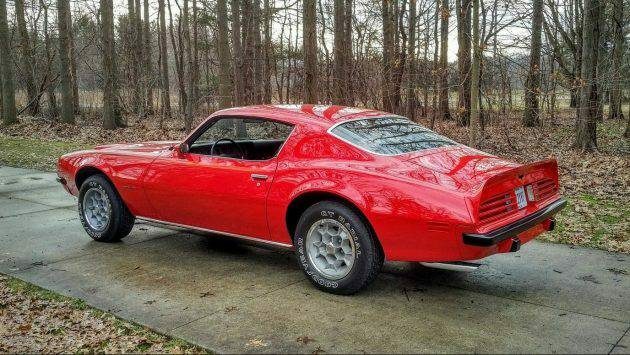 Introduced in February 1970, the Formula was the Firebird’s entry-level performance model, slotted below the top-dog Trans Am. 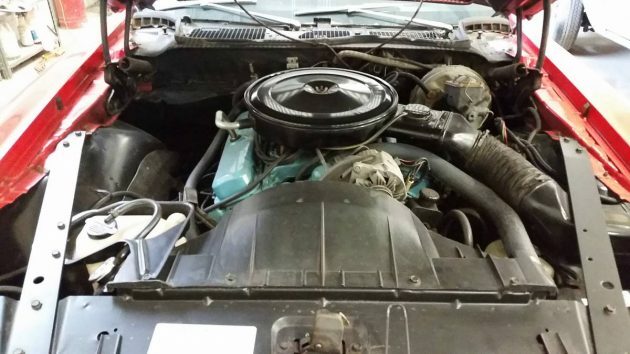 Initially offered with a 400 V8, the Formula gained the 350 and 455 as options in 1971 and featured many performance parts similar to the Trans Am. The main difference between Formulas and Trans Ams is that the Formula (except for Super Duty 455 models) came with a twin-scooped hood, whereas Trans Ams came with a Shaker hood. Having travelled only 8,237 miles in its life, this 1974 Formula is 100% original, down to its original Goodyear GT Radial tires. Though I prefer the 1970-1973 look, the slant-nose front end is attractive and the car looks cool in Buccaneer Red with Honeycomb wheels. Though rear window louvers would add some flair, this car looks just as good without them. If the new owner were to drive the car (hopefully sparingly), it would probably be best to source another set of wheels and tires. If you were hoping for the 455 in base or Super Duty form like I was, I’m afraid you’re going to be disappointed. Instead, this car is powered by the standard 350 4-barrel V8 and backed by a three-speed TH automatic. Rated at 150 horsepower and 275 lb-ft of torque, this Formula 350 does not have a whole lot of power (especially compared to the 400, 455 and 455 SD models), but since this car has such low mileage, it’s unlikely that this car will be doing many (if any) burnouts. If this car had higher mileage, I would either build up the 350 or swap in a 455, but since it is 100% original, it’s best to leave it as-is. 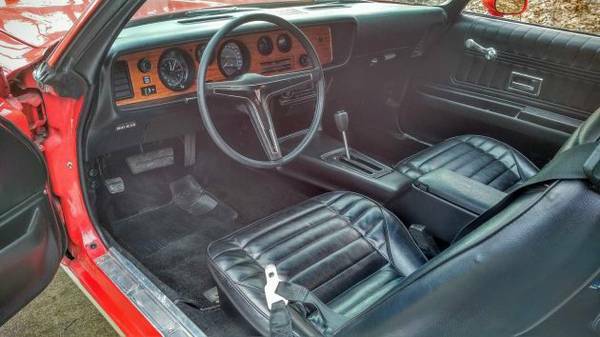 Much like the rest of the car, the interior is all-original and clean as a whistle. Though I wish this car had the Formula wheel and the engine-turned dash as found in the Trans Am, the wood-grained instrument panel is still pretty cool. I also dig the all-black gut this one has (though it probably gets real hot in the summer), and the arm-strong manual windows are a nice bonus for me. 1974-1976 Firebirds are hard to come by today and non-Super Duty Formulas are harder to find than a needle in a haystack. Though I wish this car had the bigger engine, this car is still very cool and I’ll doubt you’ll find another with lower mileage. What are your thoughts on this all-original 1974 Formula 350? I’m glad cars like this exist, but I wouldn’t want the responsibility of it’s existence. I’d rather have one I could drive. That dosen’t look like 8k carpet! “Arm strong” wind up windows? Really? Armstrong non power steering maybe, but windows? Are we really that soft nowadays? 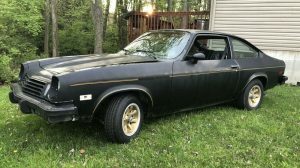 gorgeous body style, great color, increase horse power, sure low miles, still, drive her! i do like the rear design of these more than the 2nd gen ‘birds. they have more ‘presence’ and create less ’empty’ space between the rear lights and the license plate. also prefer the flat rear glass and not the wrap around version from ’75 onward. up front …. eh, that black bumper kills it for me. what could be done differently? who knows. it seems that if you were to make that chrome it would be too small to save the looks at the front. the formula hood is always my run away favorite. anyway……..
a 350 is not the end of the world. remember that all poncho blocks 326 ci and above are on the same block so —— bore it out and change the internals. it would still be a matching numbers block and if you keep the heads and assorted paraphernalia around it can always be returned to ‘stock’ condition. clearly i want a driver not a queen. mitchell, i understand why one would replace the tires but why do you suggest in your write up that the wheels be replaced? Formula wheel was in fact a factory option. No A/C likely influenced the low miles. I bought one of these after it was badly wrecked but still drive able for one hundred dollars. equipped with the 400 and S-T10 4 speed it was a blast to drive but the parts were needed for another car at the time. this one is very nice but not as fun to drive! Kind of a boring Pontiac without any creature comforts. No a/c , no thanks. Got to have my a/c. I’ve always liked the Formula hood vs the TA, there’s a late 90’s version around the corner with a blown motor. The guy wants too much for it, I’m hoping it’ll be more resonabaly priced this February when everyone up this way is broke. For me this are the best looking cars of the 70’s. 8K B.S. those aren’t the original wheels and the seat interior isn’t the original style. TOTAL B.S.! The tires are replacements; the car most likely originally came with Uniroyal Steel Belted Radials in a GR70-15 size when new. 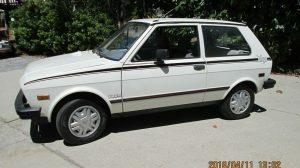 The Honeycomb wheels may or may not be original; with the car being somewhat low-optioned, it may have come from the factory with 15″ Rallye wheels instead but I think the Honeycomb wheels were an option in ’74. Nice looking car, but as others noted, the interior looks tired for a car w/ 8k on the clock. The Formula, Trans Am, and Z-28 were dream cars for me when I was a kid in the 70s/80s and this looks nice. But without documentation, how do you confirm the miles are true? You really can’t, so I’d pass at this unrealistic price.